Octodad: Dadliest Catch has some of the most interesting, and, to some, finicky controls. And that’s a good thing, being an octopus trying to act as human would be finicky. I got a chance to try out a PlayStation 4 demo of the latest from Young Horses during Gamercamp Festival 2013. Dadliest Catch is the follow-up to their original freebie Octodad, heralded for its weird plot starring an octopus living in a human world. As the octopus, you must try your hardest to fit in as a regular human. If you haven’t already gotten a chance to see the wedding intro, do yourself a chance to check it out here. It’ll give you a good glimpse into what the game has to offer. I played through another scenario where Octodad, the wife, and kids were at home just enjoying a relaxing day. Octodad wakes up and this is where getting out of bed becomes hilarious. Each leg is controlled by a trigger, the harder or longer you push it in, the more he lifts up his legs. Pressing them repeatedly back and forth will make you move faster but look equally stupid doing it. The left and right analog sticks control grabbing motions for each of his hands through L1 and R1, respectively. Already, this sounds like you’re always fumbling the controller, and that’s the point. If this is just a pedestrian moving game with simple controls, what’s the point? The controls are part of the difficulty of trying to fit in with humans as this walking sea creature. Therein lies the fun and hilarity of Octodad: Dadliest Catch. The first objective I have is to make coffee–seriously. This sounds like it’ll be an easy task but I’ll have to fumble about to do so, starting by moving over to a cabinet to carefully grab it and avoid swinging it open like a maniac to pour the beans in. Of course, I’m making a mess everywhere with the beans. Moments like these have me cracking up all over the place. 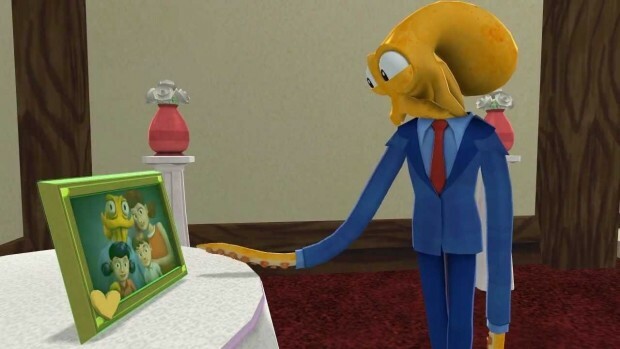 The writing is very well done, and the cut-scenes don’t take you out of the experience but rather add more depth to Octodad’s character and fatherhood. I didn’t get a chance to finish the demo since a kid with his father wanted to take the helm. I handed it off right away, wanting the kid to experience what being a sea creature father would be like. This’ll be one of the most interesting games to come for the PS4 and while you’ll have to wait until after the January Steam release, It’ll be hitting the platform sometime in February or March. But keep an eye on it if you want to have a good old time of Twister on that controller as you try to be a good octopus parent.